In celebration of NMWA’s 30th anniversary, and inspired by the museum’s focus on contemporary women artists as catalysts for change, Revival illuminates how women working in sculpture, photography, and video use spectacle and scale for expressive effect. Born and raised in Morocco, Lalla Essaydi now lives and works in New York. She received her MFA from the School of the Museum of Fine Arts at Tufts University in 2003 and has since participated in several major exhibitions around the world. 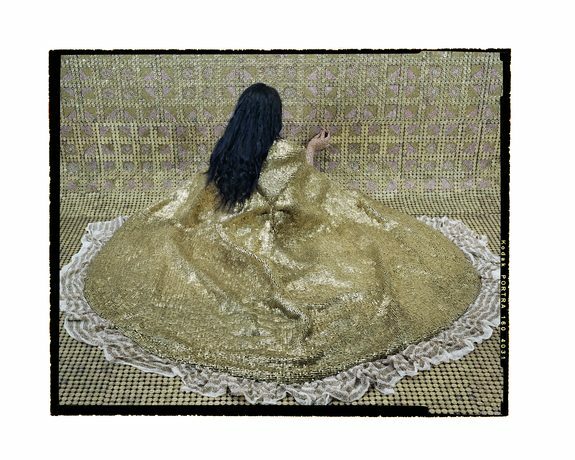 Essaydi’s intricately staged photographs not only draw the viewer in with their scale and beauty, but go further to challenge 19th century Orientalist mythology, which portrayed Arab women as sexual objects for male fantasy. While she often imitates the poses of Orientalist painters, she controls the gaze. Essaydi portrays her subjects clothed and covered in henna calligraphy. This stylistic choice challenges the tradition of calligraphy as a male-dominated art form. 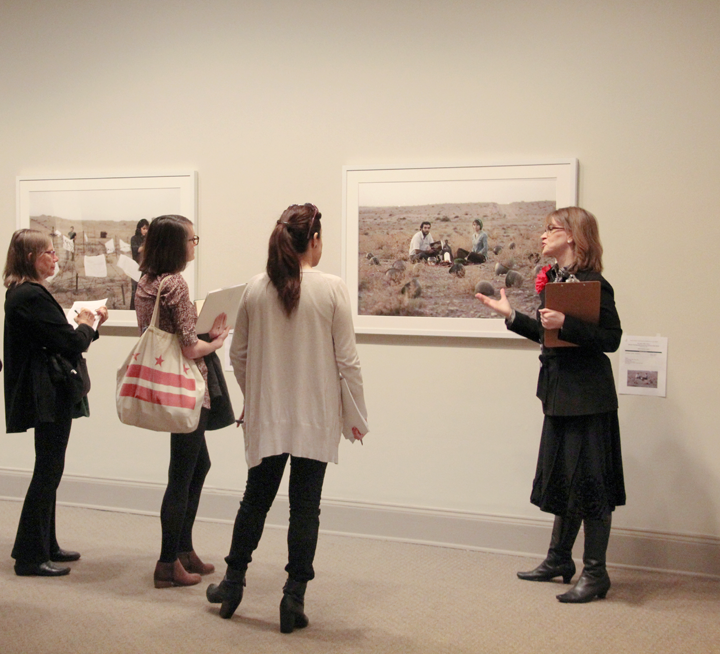 Two of Essaydi’s photographs from her “Bullets Revisited” series are on view. A recent acquisition into NMWA’s permanent collection, the triptych Bullets Revisited #3 (2012) portrays a reclining woman, whose skin and garments are covered in henna calligraphy, against a background embellished in silver and gold bullet casings. By presenting this photograph in a triptych format, the fragmentation of the body denies a voyeuristic view of the figure. In Bullets Revisited #20 (2014), she cocooned her seated model with a cape encrusted with similar casings. Essaydi explains her use of bullets as a commentary on violence against women in a new post-revolutionary era following the Arab Spring. Visit the museum and explore Revival, on view through September 10, 2017. —Roseline Odhiambo is the summer 2017 digital engagement intern at the National Museum of Women in the Arts. Can Art Rouse the Spirit? Experience “Revival” this Summer! On June 23, NMWA’s second floor will come alive with brilliant contemporary sculpture and photo-based art by 16 women artists in the summer exhibition Revival. The show explores the featured artists’ representations of the body, the child, and other creatures through a remarkable range of media, scale, and techniques. Hanging sculptures, video projections, and large-scale photographs create immersive, mesmeric environments while smaller meticulous works draw the viewer close, beckoning toward sensations that spark memory and emotion. Each artist connects to the unconscious through highly allusive depictions of human and other animal bodies. The artists in Revival employ a wide range of materials in their works. Working with hair, yarn, velvet, wax, marble, found objects, taxidermied birds, and lens-based media, to name a few, these artists explore materiality in meaningful and impactful ways. In the triptych from the series Bullets Revisited #3 (2012), Lalla Essaydi portrays a reclining woman with her face turned toward the viewer, confronting the historical Orientalism of Western artists, particularly sexualized depictions of women. Upon a closer look, the viewer will notice that the figure’s body is covered in henna calligraphy, challenging the tradition of calligraphy as a male-dominated art form. The woman’s dress and surroundings are elaborately decorated with silver and gold bullet casings. Essaydi explains her use of bullet casings as a commentary on violence against women in a new post-revolutionary era following the Arab Spring. 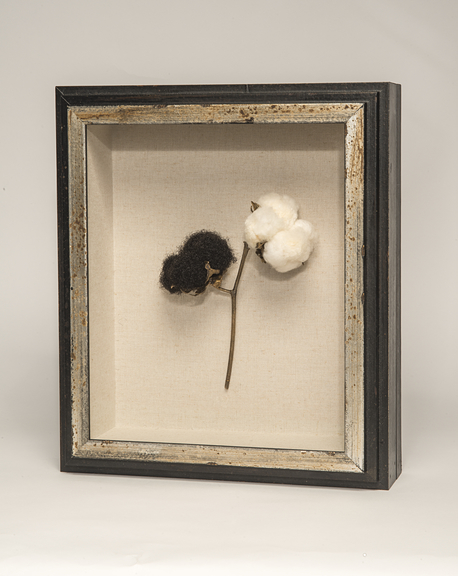 In Cotton to Hair (2012), Sonya Clark juxtaposes a boll of cotton with human hair to allude to the history of slavery in the U.S., acknowledging cotton as a key contributor to U.S. trade and wealth in the early 1800s. Clark combines cotton with a tuft of dark human hair, referencing African American slaves who worked in the fields to create this wealth. The exhibition features powerful works by Louise Bourgeois, Petah Coyne, Alison Saar, Joana Vasconcelos, Patricia Piccinini, alongside other artists featured in NMWA’s collection. Revival illuminates women who regenerate sculpture and photo-based art to profound expressive effect. A survey of the museum’s collection in its 30th year inspired this exhibition, which is enriched by important loans from public and private collections as well as artists’ studios. Visit the museum and see Revival, on view from June 23 to September 10, 2017. 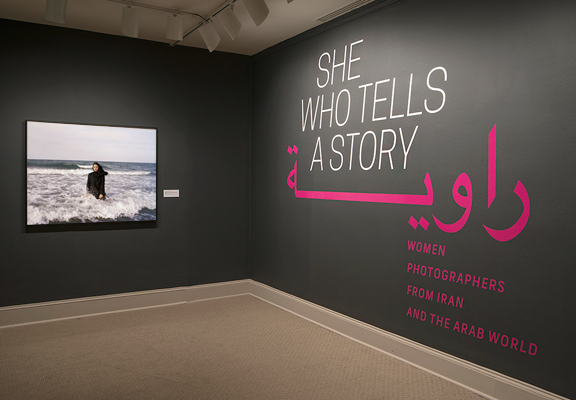 NMWA’s summer exhibition She Who Tells a Story: Women Photographers from Iran and the Arab World is organized around three themes: Deconstructing Orientalism, Constructing Identities, and New Documentary. “Orientalism” refers to ideas about Eastern cultures that reflect Western fantasies and political priorities rather than reality. The 19th-century art movement established many artistic conventions that have had a lasting impact on how these regions—and their inhabitants—are portrayed. The artists in She Who Tells a Story show an awareness of the influence of Orientalism on the representation of Iran and the Arab world. By critiquing Orientalist artistic conventions, these artists forge a place for themselves as narrators of their own experiences rather than objects of fantasy. Many works in She Who Tells a Story examine the role of the female body in Orientalist imagery. Lalla Essaydi’s Bullets Revisited #3 reveals the inherent violence in objectified representations of women. The triptych portrays a reclining woman covered with henna calligraphy and surrounded by bullet casings. The subject simultaneously entices viewers with beauty and confronts them with violence, signified by the bullet casings and fragmentation of the body. The photograph mingles violence and pleasure as the figure’s gaze confronts viewers. Artists also engage with the Orientalist tradition to reveal its political ties to imperialism. Rania Matar’s Mariam, Bourj al Shamali Palestinian Refugee Camp, Tyre Lebanon, from the series “A Girl and Her Room,” echoes the work of 19th-century Orientalist painters, whose popular works often showed idle figures in exotic but decaying settings. Art historians have argued that this convention implies that the people portrayed are passive and morally deficient—a political message meant to justify colonization. The identification of the setting of this photograph as a refugee camp questions these assumptions by linking idleness and disrepair to war and displacement rather than moral failings. This, along with the subject’s direct and self-aware gaze, exposes the fallacy of Orientalist reasoning and redirects moral scrutiny onto the legacy of colonialism that continues to contribute to modern conflict. The ongoing use of Orientalist imagery is a major concern for many of the artists featured in She Who Tells a Story. By deconstructing the political and visual conventions of Orientalism, artists like Lalla Essaydi and Rania Matar expose their violence and inaccuracy. The destruction of the Orientalist fantasy of Middle Eastern womanhood also allows for the possibility of female subjects—women who can see, think, create, and tell their own stories. —Kait Gilioli is the summer 2016 publications and communications/marketing intern at the National Museum of Women in the Arts. In Arabic, the word rawiya means “she who tells a story.” Each artist in NMWA’s summer exhibition She Who Tells a Story: Women Photographers from Iran and the Arab World offers a vision of the world she has witnessed. Essaydi began her career as a painter—she developed an interest in photography first as a means of documenting her other work, and then, she says, “It became a medium I fell in love with.” She creates multilayered images that confront the historical Orientalism of Western artists, particularly sexualized depictions of North African and Middle Eastern women. Her images often focus on a woman or small group of women whose clothing and bodies are decorated to match their surroundings. She uses henna—reclaiming the traditionally “male art of calligraphy”—to challenge gender dynamics within Moroccan and Arab cultures and between the East and West. 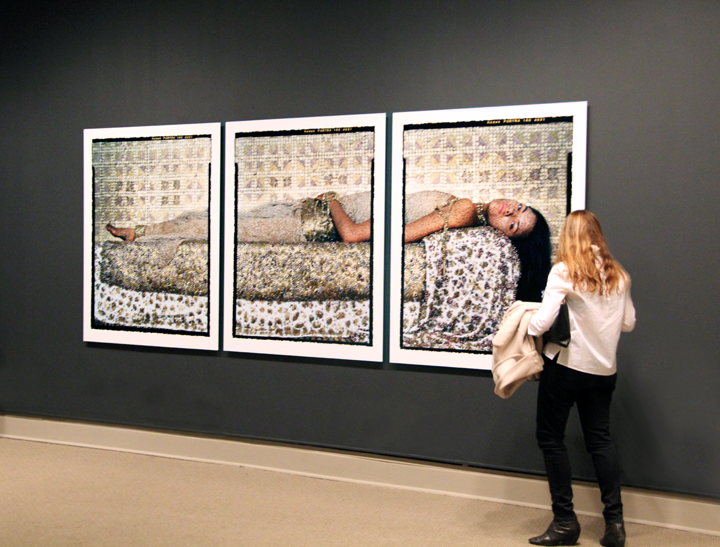 The large-scale triptych Bullets Revisited #3 (2012), a set of chromogenic prints on aluminum, is in many ways characteristic of her work: it references Orientalism by depicting a woman lying down, and her body and clothing provide a canvas for henna calligraphy. In addition to henna, however, her surroundings are elaborately decorated with silver and golden bullet casings. With these, Essaydi evokes symbolic violence and restrictions on women. The work’s visible black film borders emphasize the image’s artifice. It is large and visually lush, but Essaydi uses the borders, as well as the elaborate setup and deliberately abstracted, uninviting space, to underscore the fact that it does not reflect reality. 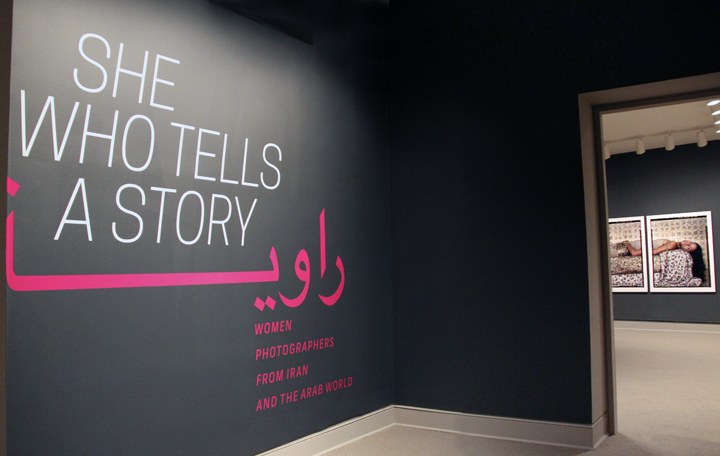 Visit the museum and explore She Who Tells a Story, on view through July 31, 2016. —Elizabeth Lynch is the editor at the National Museum of Women in the Arts.